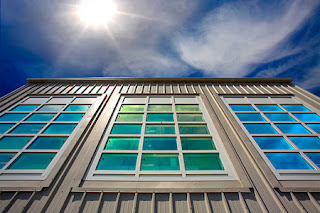 Preface: Researchers at the window testing facility at Lawrence Berkeley National Laboratory are developing dynamic windows treated with nanocrystals that block heat from the sun when a small electrical current is applied --- useful for hot summer days. Speaking of smart, researchers are developing smart windows. It's a high-tech effort to cut down on the huge amount of energy that leaks through windows. LAAs someone who studies windows, Howdy Goudey isn't surprised that most of us find them a little boring. Well, it's a pretty pedestrian object. You know, what's new to do with a window? But here at Lawrence Berkeley National Lab, windows are the focus of some cutting-edge research. Goudey uses an infrared camera to look at how windows lose heat. The camera shows us as red and yellow blobs on a nearby monitor. We look like, you know, funny rainbow people. But it's representing surface temperatures of the object it's looking at. For the most part, windows aren't good insulators. They leak heat in the winter and let heat in during the summer. Many homes still have single-pane windows which, as this promotional film explains, were the name of the game during the post-World War II building boom. Entire walls of glass take advantage of California's sunshine. And glass walls like these are cheaper to construct and maintain, since this California climate makes insulation unnecessary. Of course, insulation is necessary, as the country found out when energy prices skyrocketed in the 1970s. Double-pane windows became common, and then came double-pane windows with invisible coatings which are twice as efficient. Today, they make up more than half of windows sold. At a hardware store, these are labeled low-e windows. When sunlight shines through a window, it provides both light and heat. Most of us want light coming in. But heat is the last thing we want on a hot summer day. If you have a few windows in a room with direct sun on them, it's equivalent to running a little space heater. So this coating blocks the heat from the sun while letting in the light. But here's the problem: On a cold winter day, that extra heat from the sun would be helpful. You'd actually like that solar energy to come in and help heat the space. So that motivates the idea of a dynamic window. At the lab's Molecular Foundry, Delia Milliron is developing a smart window, a window that can change based on the weather. So, nanocrystals are very small that's why when we spread them out in a coating on the window, you don't see anything. In one setting, the coating lets in the light and heat from the sun. But apply a small electric current...It's only a couple of volts, so that - what you can get from a normal battery. That's enough to change the charge of the nanocrystals so they block the heat from the sun, but not the light.Milliron says that ideally these windows would be controlled by your heating and cooling system. That means windows could make buildings more efficient instead of being the energy losers they've always been. All that lost energy costs money, says Stephen Selkowitz, head of building technologies at Berkeley Lab. It costs homeowners about $40 billion a year. And I'd rather have the 40 billion in my pocket than sort of sending it out the window. Smart windows could be widely available in as little as three years, but they won't be cheap, possibly twice as much as today's windows. The cost should come down as manufacturing ramps up. And one day, smart windows could be written into buildings codes, where the technology would have a much broader impact.